The chronology of Marvel Comics’ current Star Wars series is set within the (new) expanded universe of Star Wars, and time-wise between Episode IV and V. Just like Brian Wood’s Star Wars series for Dark Horse Comics, this can create continuity problems. So far Jason Aaron has mostly avoided these, but the emergence of Sana Solo in Star Wars #8 and #9 does raise questions. However, for the most part, Star Wars #9 delivers a strong and exciting issue. During the last issue, Sana (Han’s supposed wife, which he denies) is holding Leia captive until Empire forces arrive. Sana quickly switches allegiances when she finds out that Han is wanted by the Empire as well. Both Leia and Sana are mad at Han, though for very different reasons. Meanwhile, Luke has been captured by a Hutt who is a “collector” and his hobby is gathering trophies from the vanished Jedi Knights. He takes an interest in Luke and his light saber, but he also appears to be willing to pit Luke in some sort of death duel for his own entertainment. The twist of Luke being capture by a Jedi memorabilia collector is an interesting move for Aaron in Star Wars #9, as it’s something totally plausible (considering the world believes that there are no Jedi left) and novel. We get a brief glimpse of the Hutt’s trophy room, but it would be nice to see some of the other trophies in more detail, or at least get some more background on the Hutt to figure out why he’s become so obsessed with Jedis. It’s an opportunity to develop a character, albeit a minor villain, in a way that enriches the total story. For now, the Hutt is compelling foe for Luke (and for Chewbacca, who will be attempting a rescue mission for Luke). I mentioned in the review for Star Wars #8 that it didn’t seem likely that Sana Solo would end up being a foe for very long, though I was hoping that she ended up being one. The switch comes almost immediately for Sana, which is a lost opportunity I think. Aaron does give her a nice character-defining reason for switching. Initially, she thinks the Empire only wants Leia, so Sana is willing to negotiate with them. However, as soon as it’s clear that Han is in danger, she fights the Empire. It indicates that Sana cares very much for Han, maybe validating his claims that she isn’t being honest about being his wife. That would be a good out for this plot point because the unknown wife raises some continuity red flags in the same way that Leia being engaged during Wood’s Dark Horse Star Wars series did for me. These are notable events that would seem to come up some time during Episodes V and VI. That’s the contradiction about writing a new series within an existing story timeline and continuity – it has to be exciting and important but it actually can’t be so important that something happens that is never mentioned later by one of the main characters. If Sana is lying and she is not Han’s wife, that would be a way to avoid the issue that it’s never mentioned later. As far as the art from Stuart Immonen, who also drew Star Wars #8, it is once again very well done. Immonen’s art has a lovely fluid quality and he also captures the look of the various characters of Star Wars (and therefore the actors who played them) quite well. Since Sana is a new character, there is more leeway with her look. I don't know if Immonen designed her, but he draws her in an appealing way. She is attractive and an effective fighter, so it’s easy to see why Han could’ve gotten involved with her (whether he married her or not). 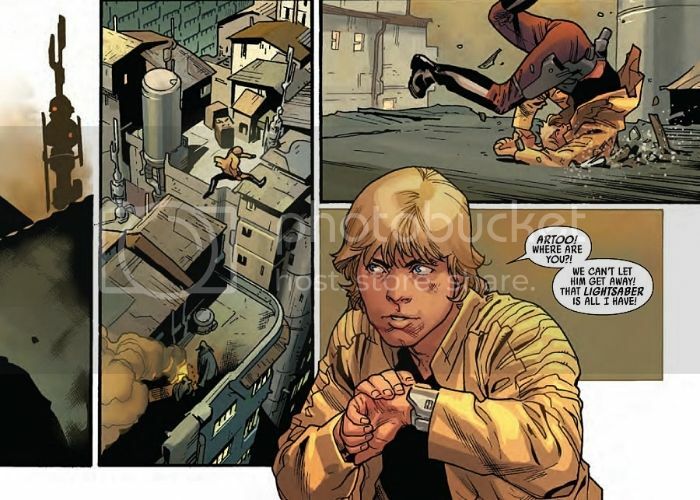 At the same time, Immonen draws nice action scenes too, such as when Luke is chasing a thief who stole his light saber. The art really rounds out the story well in Star Wars #9. This issue may not be the best of the series so far, and there are certain elements that don’t entirely hold up upon close analysis, but Star Wars #9 is also a fun issue that has some good character beats, a few good action moments and a number of surprises. Aaron seems to know that he has to combine approaches for an effective Star Wars story. Star Wars #9 is a good middle chapter in the current arc, advancing story lines and setting up upcoming conflicts worth watching.